Pop quiz - What did I spread all over my yard this weekend? I'll make a straw-man proposal: it's straw, man. This weekend we aerated most of the back yard, seeded, fertilized, and spread milky spore to cut down on the japanese beetles. Christi found info on the web saying that a layer of straw is good for keeping warmth and moisture down on the grass seed/sprouts, and can be mowed in as compost once the lawn starts to grow. 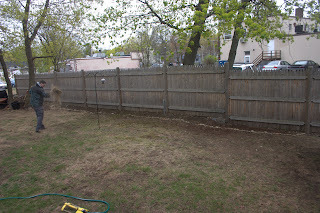 I'm just hoping that the whole exercise goes better than last year, when I tried to re-seed half the yard WAY too late in the summer and ended up with scorched earth for the rest of the year. 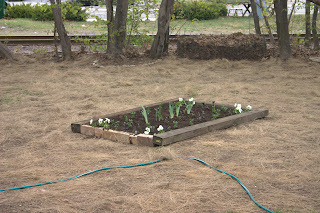 In related news, we handled the trickiest spot in the yard (over the top of the septic tank, average depth 1.5 inches of crappy topsoil) by planting a quick flower garden in a few inches of new topsoil/manure/peet mixture contained with a couple of 4x4s pulled out of the scrap pile. Thanks to C&K for bringing us some of the lilies torn out of their garden - the new centerpiece for ours! that is so cool. will you come over and do our yard too?